A traditional Japanese recipe is Yakitori chicken. 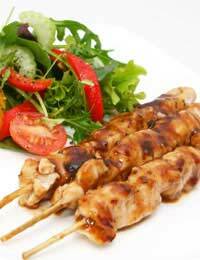 This is a Japanese style kebab that is great for barbecues or for parties. If you do not want to use chicken it is possible to use other meat,such as turkey,instead. It is also possible to use all different parts of the bird, such as skin, liver etc, when making yakitori. 2 bunches of spring onions and 12 boneless chicken thighs. First take 24 bamboo skewers and soak them in water for approximately 40 minutes. This will help prevent them from scorching when they are placed under the grill. Next you need to make the sauce that will go with the chicken. To do this first take the sake(or wine), sugar and soy sauce and, using a medium size saucepan, mix well with the flour and bring the ingredients to the boil as you continue to stir them. Once boiling point has been reached, reduce the temperature and simmer the mixture in the saucepan for approximately 15 minutes. After this time the mixture should have reduced by around a third. Once this has happened, place the mixture to one side. Next take the chicken thighs and cut them into bite size pieces before setting aside. Now it is the turn of the spring onions. These should be sliced into pieces that measure approximately 5 cm. You next need to light the barbecue or grill. Remove the skewers from the water and place the chicken and onions on them alternately. Now you are ready to place them on the barbecue or, on a medium heat, place them under the grill. Ensure that you coat the chicken well with yakitori sauce. Cooking time should take approximately 10 to 15 minutes. Another popular Japanese meat recipe is Oyako-Don. First take the chicken breasts and cut them into portions that measure approximately 4 cm in length. Next take the dashi, soy sauce, sugar and sweet rice wine and place in a saucepan before bringing to the boil. Next take the chicken and add to the ingredients. To cook use a medium heat for approximately 5 to 10 minutes. Once cooked, take half of the chicken and stock mixture and pour into a frying pan. Heat the mixture until it comes to the boil and then add half of the beaten egg mixture to the frying pan and top off with a tablespoon of peas. Next continue cooking on a medium heat, but with the frying pan covered, until the egg is just set. You should then place the mixture on a plate, ensuring that it is kept warm as you repeat the process to cook the second portion.